So, how did the rockets fare? 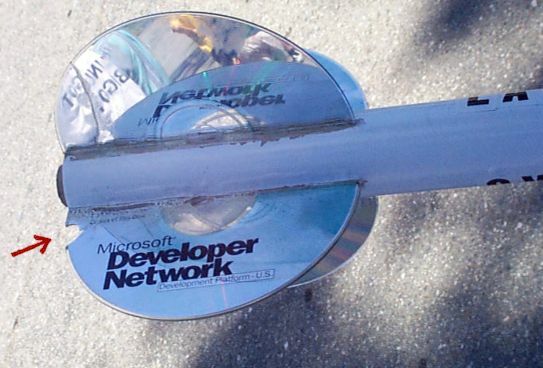 The "Internet Exploder 98" lived up to its name by literally exploding on the launch pad. The collected pieces are shown here. You will note that, of the rocket's title, only "Internet" remains. The remainder was burned away when the engine exploded. There are probably some clever analogies I could make here, but I'll refrain. 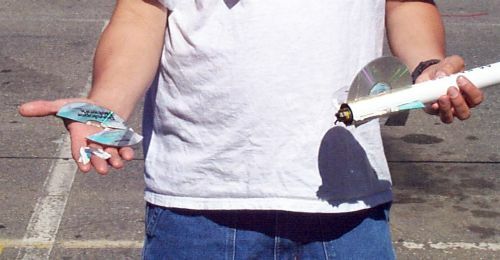 After the first flight (using a "B" engine) the Win98 CD rocket sustained some small damage, a chip from one of the CD fins. It was adjudged safe to fly again, and went up twice more. Aaand... the aftermath. The third and final flight used a powerful composite-fueled "D" engine, which sent the rocket up and nearly out of sight. The chute failed to deploy properly and the body did a free-fall to the pavement, in the process breaking two of the fins. 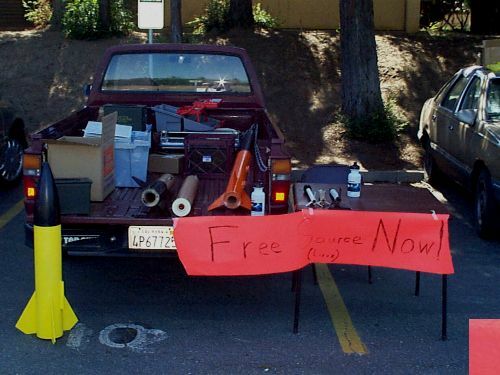 The sign below reads "Free Source Now! (Linux)". 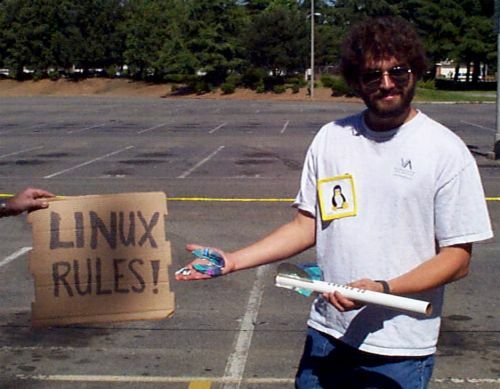 Apparently a high-power rocketeer shares the Linux enthusiasm. (these rockets are too large to be flown at this site, this is just a display). 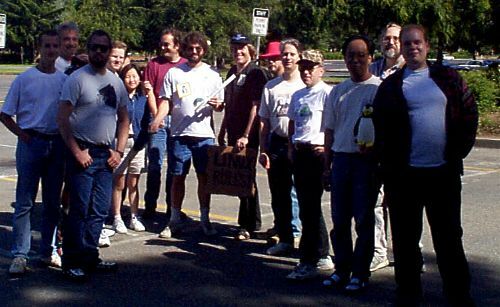 Some of the gang at the launch site. All in all, it was a fun way to spend a Sunday afternoon. I mean, normally I'd be indoors coding, but it's good to see the sun every once in awhile, right? Afterwards some of the gang went off to eat, others left to post their pictures to the net.